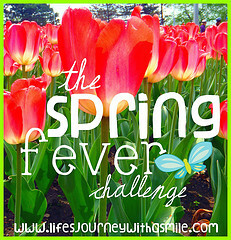 See How She Runs: Spring Fever Challenge- Week 2 ! This week's positive picture is from my childhood. 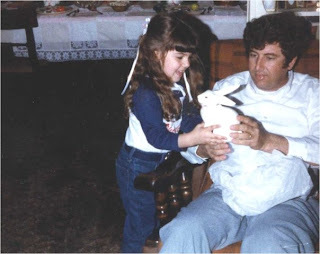 I think I am about 4 years-old celebrating Easter at my Grandmother's house. My Grandmother always had her house decorated for the different holidays. At Easter, she always decorated her table with beautiful marble eggs, and made coconut cake. She cooked a big meal, but I would hurry though lunch and be ready for my Granddaddy to hide our Easter eggs. Goal 3- Fitness Class -Had a blast with spinning class on Tuesday...I think I will attempt the Muscle class again this week. Goal 4- Fitness Adventures with Humphrey- Didn't happen this week...it has been to rainy and yucky out...the weekend was nice, but we were out of town. Goal 5- Vitamins and Supplements- Missed one day! Goal 6- Strength Training- Got in 2/3. 2. What did you do this past week to make you feel good about yourself? Bubble Bath and Mud Mask :) I am not a bubble bath type of girl... I am more of a quick shower person. But it was nice and relaxing...and I enjoyed the "me" time!! 3. Are your SFC goals your ultimate goals or steps to your ultimate goals? Do you find it easier to set big goals or do you like making mini-goals? My ultimate goal is to live a healthy life...Mind, Body, and Spirit. My SFC goals are things I can do everyday to help achieve that ultimate goal. My bucket list had completing a 5k on it...and I DID that for the first time last year! Now I was to complete a half marathon! ONE DAY!!!! I would also love to take my husband to see a Florida Marlins game in Miami...he would love that and I would love experiencing his joy. I have always wanted to visit all the states in the US. 5. Fun Question: If you could achieve only one more thing in your life, what would it be? I hope I achieve many, many more things in my lifetime...if I only had one more achievement I would hope it would be that when people remembered me...they smiled. Cute picture!! And great job so far. You are a total rockstar! You're doing a great job! Love the picture! I love your picture!!! Easter memories are the best because we always did the big easter meal and the egg hunt with massive baskets filled with goodies! You are doing wonderful with your goals! Sounds like you had a great week! YAY!!! I'm not really a bubble bath person either! Glad you enjoyed it! That's so cute that you said you would love to take your husband to a Marlins game because he would enjoy it and you would love experiencing his joy! You sound so positive :) Great week, good luck for this week. You're always such a trooper with your goals! and I definitely smile every time I think of you... so consider that done! I think you'll definitely achieve MANY MANY more goals because you're so driven! What a tough chick you are. Thanks for the inspiration!